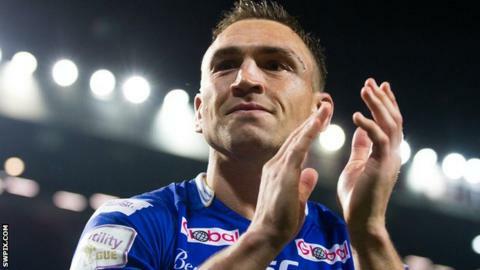 Former England rugby league captain Kevin Sinfield says it is "probably too soon" for him to make his union debut after joining Yorkshire Carnegie on an 18-month deal. The 35-year-old stand-off finished his league career less than a month ago - in Leeds Rhinos' treble-securing Super League Grand Final win against Wigan. He has already begun training with the Championship union outfit. "I'd love a run, but maybe it's a bit early," Sinfield told BBC Radio Leeds. "Out of respect for the team, and the two lads with the [number 10] shirt it's probably the right thing that I didn't, given I've had a week's training." Sinfield added that if coach Bryan Redpath said he could play 20 minutes of a match he would "snap his hand off". As Sinfield comes into union with enthusiasm and hunger, there is speculation surrounding fellow code convert Sam Burgess and his future in the 15-man game. While Sinfield is at the tail end of a glittering career for club and country, Burgess is at a crossroads, as brother Thomas acknowledged in a BBC Sport interview. Burgess, 26, was controversially picked as a centre for England during the recent World Cup after switching codes in 2014. There have been several reports about him being lured back to the 13-a-side code. "Other league players who made the switch, they all take differing times," Sinfield said. "Me and Sam are very different, and I think he's done extremely well. To play in a World Cup after 12 months is remarkable, and Sam will do what's right for him. "I know there's a lot of speculation, I think if he were to join any Super League club it would only be the Rhinos, but I'm aware of the interest from the NRL, particularly South Sydney, a place that's close to his heart - we'll see what happens. "Whether he decides to stay or not, he'll show everyone what a fantastic rugby player he is." The challenge for Sinfield is adapting to new surroundings, a new group of team-mates and a new code of rugby which has unfamiliar nuances. Though he is a fan of union, he has spent all of his 21 years at Leeds in the 13-man game. Sinfield says the most difficult thing is "a combination of walking into the new dressing room, I've not done it since I was 13, as you're never quite sure if you'll be accepted, and then trying to build some of the friendships you need to go out on the field". "Building trust and honesty takes a period of time," he added. "I'm trying to make up for time with lads who have 15 or 20 years. Everybody's aware I'll make mistakes and get things wrong, but hopefully the positives I'll bring will outweigh the negatives. "The two 10s Joel [Hodgson] and Harry [Leonard] spend a lot of time with me, they've been fantastic with me, at the moment they've got the shirts and are playing brilliantly." Much like Burgess' arrival at Bath last season, Sinfield has gone straight from the rigours of a Super League season into a union campaign. And it was not just any league season, but one that ended with the Challenge Cup, League Leaders' Shield and the Super League title all secured in style by the Rhinos. "The finish we had rejuvenated me, we won three trophies, the last three weeks of the season were incredible," Sinfield added. "To finish with that I then had a week away in the sunshine and rest with the kids, and a change is as good as a rest. "I'm ready to get cracking, it's very different but that doesn't mean it's not fun or I'm not going to make a success of it."